Is your surname Ben Shlomo Zalman? Gaon Eliyahu Ben Shlomo Zalman, The "Gaon of Vilna"
Also Known As: "Hagaon MiVilna", "HaGra", "Rabbi Eliyahu the Gaon o", "Gaon of Vilna", "רבי אליהו בן שלמה זלמן", "גאון רבינו אליהו", "הגר"א", "הגאון מוילנא", "Eliyahu Kremer", "The Vilna Gaon", "Rabeinu Hachosid Rabon Shel Kol Bnei Hagolah", "Eliyahu Zalman Kremer - The VILNA GAON", "Ha'Gra", "..."
Elijah ben Shlomo Zalman, the Vilna Gaon, ‫ר' אליהו בן שלמה זלמן - Gra "Gaon Rabbenu Eliyahu" - ha'Gaon ha'Chasid mi'Vilna. Rabbi Elijah of Vilna was Lithuania's greatest Talmudic scholar and one of Judaism's greatest spiritual and intellectual leaders of modern times. He was, because of his fame, known simply as "The Vilna Gaon, or HaGRa (HaGaon Rav Eliyahu). His brilliance extended to mathematics, geometry, astronomy and other sciences. Elijah, the Gaon, Chief Rabbi of Lithuania, possessed such a prodigal memory that he never forgot a book once he read it. Prof. Graetz, the noted contemporary historian states that the Gaon committed to memory 2,500 volumes. He knew by heart the Bible, Midrash, Mekilta, Sifre Tosefta, Seder Olam, the Talmuds (Babylonian and Jerusalmi), the Zohar, the Code, Rashi, Rambam, etc. and could quote any passage at will. Rav Eliyahu ben Shlomo Zalman of Vilna, known as the Vilna Gaon or G"RA, is one of the most dominating figures of halachic Judaism since the Shulchan Aruch. Born in Brisk (Brest-Litovsk) in 1720, he was the author of countless works in all areas of Rabbinic literature, including Aderet Eliyahu on the Torah, a commentary on the Mishna, and commentaries on both the Babylonian and Palestinian Talmuds. He also wrote commentaries on the Mishne Torah of Rambam, as well as on the Shulchan Aruch. Demonstrating his versatility and familiarity with all areas of Jewish knowledge, he penned a work on the Sefer Yetzirah, one of the main kabbalistic books. He was the student of the Pnei Moshe, as the teacher of, among others, Rav Chaim Soloveitchik of Volozhin. He passed away in 1798. R' Gaon of Vilna Eliyahu (Eliahu, Elie) ben Solomon (Shloime) ZALMAN Born: Apr 23, 1720 in Belarus. Died: Oct 9, 1797 in Vilnus. Gaon of all Gaons "The Prince of Princes, Chariot of Israel and its Horsemen"
Note: JE, Index of articles and Wikipedia: "Elijah (Eliyahu) ben Shlomo Zalman, known as the Vilna Gaon, (also the Gaon of Vilna or "The Gra" from the Hebrew acronym "Gaon Rabbi Eliyahu"), was one of the most outstanding rabbis in recent centuries. He was an exceptional Talmudist, Halachist and Kabbalist, and was the foremost leader of non-hasidic world Jewry. He is commonly referred to in Hebrew as ha'Gaon ha'Chasid mi'Vilna, "the saintly genius from Vilna. He was one of the most influential Rabbinic authorities since the Middle Ages, and – although he is counted among the sages known as the Acharonim – he is held by many authorities after him as belonging to the Rishonim (Rabbinic authorities of the Middle Ages).."
The Gaon's ancestry and progeny, as well as those of his siblings (such as the famed Rabbi Abraham Ragoler, author of Ma'aolot HaTorah and his cousins includes many famous families in the religious and secular Jewish world. eg. Rabbis, doctors, lawyers, teachers, college professors, The Gaon was descended from his seventh generation ancestor, R. Petachiah, surnamed Sofer, as he was a scribe in the ancient city of Prague. He was the father of another ancestor of the Vilna Gaon, R. Moses Rivkes, born about 1590, author of Be'er HaGolah, a commentary on the Shulchan Aruch. The second ancestral line for the Gaon was through David Ashkenazi who settled in Cracow, where his son Moses (surnamed Kramer, as he was a shopkeeper) was born. R. Moses served as a rabbinical judge (dayan) in Brest-Litovsk, and then head judge in Vilna where he died in 1687. The son of Moses Kramer, Elijah Chassid , died in Vilna in 1710, he married the daughter of Moses Rivkes. 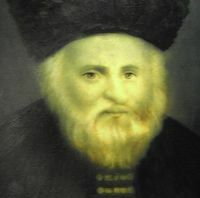 There were the parents of Issachar DovBer of Vilna, father of Solomon Zalman (died in Vilna in 1758) who married Triena and were the parents of the Gaon of Vilna. The book of Mishlei (Proverbs, 1:8) states: Heed, my son, the moral advice of your father, and do not abandon the teaching of your mother. The Gaon of Vilna comments on this sentence: Man has three partners: the Holy One Blessed Be He, his father and his mother. (1) Know from whence you came, and (2) Where you are going, and (3) To Whom you will have to give account in the future. Only if we know from where we originate in terms of our family heritage will we be in a position to decide what path in life we should take in the future. Accordingly some Zaddikim devoted their lives to genealogical research. The study of genealogy, therefore, can be considered as an act of zeikher le'maaseh bereishit, as we seek to link ourselves, through the generations of our ancestors, with the first living man, Adam. The Vilna Gaon - Rabbi Eliyahu of Vilna (1720 - 1797)- The word 'gaon' means genius and on no person could this title be more appropriately bestowed than on Rabbi Eliyahu of Vilna. Rabbi Eliyahu was probably the most influential Jewish leader in modern history. Rabbi Eliyahu's great abilities began to show at a very early age. At the age of seven he gave his first public discourse and displayed a fully developed intellect. By the time he was ten he had advanced to the point where he no longer needed a teacher. When he was still a young man, Rabbi Eliyahu accepted upon himself 'galus,' self-imposed exile (a not unheard of practice at that time), in which he wandered from community to community as a beggar. This lasted for a period of some years whereupon he returned to the city of Vilna. Despite efforts on his part to hide his great righteousness and phenomenal knowledge, he was soon famed as a great tzadik (righteous man) and Torah scholar. At the age of 35 he was approached by one of the leading sages of that time, Rabbi Yonason Eybschutz, to act as an intermediary in the conflict between him and another great sage, Rabbi Yakov Emden. To the Gaon, limud haTorah (the study of Torah) was of paramount importance and this ethic was fully displayed on his part. His diligence in learning was unsurpassable. The Gaon's son testified that for fifty years his father did not sleep for more than two hours in a twenty-four hour period. His breadth of knowledge was amazing. He was capable of stating from memory the number of times any sage was mentioned in any particular book of the Talmud. His knowledge of both the revealed and the hidden parts of the Torah was beyond compare. The Gaon considered secular knowledge to be a vital adjunct to Torah study. He was knowledgeable in almost all secular fields and authored books on grammar and mathematics. His righteousness and kindness were also legendary. Despite his personal poverty he always gave 20% of his income to charity. When informed of a special need such as marrying off an orphan girl or redeeming a captive, he would frequently deduct money from his personal needs to contribute. Despite his constant diligence in learning he always kept an ear out for people in need and was known to interrupt his studies in order to meet with relatives of a person in need to convince them to help their relative out. There is a story of the Gaon which illustrates the kind of kindness he was capable of. The city of Vilna paid a small monthly stipend to the Gaon. (It should be noted that the Gaon refused to accept any official position in the community despite the fact that he was generally viewed as the leader of the community.) The individual who was responsible for delivering this money would take this money for himself. The Gaon, who realized what was happening, never accused him of doing this nor told anyone of it because he did not want to shame the person responsible. Indeed, we would not even know of this incident if the guilty person had not confessed on his deathbed. For forty years he studied in isolation, from that point on he began to take in students from the outstanding Torah scholars of that time. Most of the writings we have today from the Gaon were transcribed by these students. One of the most famous of the Gaon's students was Rabbi Chaim of Volozhin, founder of the Volozhiner Yeshiva. This yeshiva (Talmudical academy) was the premier center of Torah study for about 100 years and is the ancestor of most of the yeshivas that exist today. Possibly the Gaon's single biggest contribution to the Jewish people was his corrective notes on most of our ancient texts, particularly the Talmud. Over the centuries errors had crept into the various texts due primarily to scribal mistakes. (We are talking here about ancient texts other than the Torah itself. The rules for writing the Torah are so strict that scribal error is nearly impossible and extraordinarily rare. Such mistakes as do occur rarely go unnoticed long enough to be duplicated into other scrolls.) These errors were serious obstacles to advanced study of the Talmud and other texts. The Gaon, with his phenomenal knowledge of the entirety of the Torah literature, was possibly the only individual capable of creating authoritative corrections of these texts. There is almost no ancient Torah text that does not bear the notes of the Gaon. For many years the Gaon desired to travel to the land of Israel and settle there. The Gaon actually began the traveling at one point but was unable to complete the trip (the reason for this is unclear). It was during this trip that the Gaon wrote his famous letter back to his wife instructing her on various ethical issues such as educating their children during their separation. This letter has become a classic in it's own right. Ultimately, about ten years after the Gaon passed away, many of his leading students followed in their master's footsteps and settled in the land of Israel. The Gaon was the leading opponent of Chassidus, a movement founded by Rabbi Yisrael Baal Shem Tov in the 1730s (approximately). The Chassidim instituted a number of changes in standard Jewish practice and many great leaders viewed them as a nascent breakaway sect from true Judaism in the manner of similar movements in the past. The emphasis of Chassidus on mysticism was particularly worrisome in this regard. Chassidus also placed a very strong emphasis on fervent worship. While this is well within the boundaries of traditional Judaism, many of the opponents of Chassidus, called 'Misnagdim,' misunderstood this emphasis as detracting from the importance of Torah study. (This error was not without basis; unfortunately, many Chassidim (followers of Chassidus) also fell into this error.) The reasons behind this great controversy are complex and it is really not possible to do justice to them in a short essay. To all intents and purposes the controversy ended in the early 1800s with the introduction of the anti-religious Haskalah movement which created a need for all religious Jews to form a common front. Despite the Gaon's opposition to Chassidus he was widely recognized by all groups as the leading torah authority of his time. Indeed, when after the Gaon passed away certain individual Chasidim expressed happiness at the news of his death, Rabbi Shneur Zalman of Liadi, one of the most prominent leaders of Chassidus at that time, issued a public letter forbidding such statements and requiring his followers to speak of the greatness of the Gaon. The Gaon passed away in 1797 leaving behind a tremendous legacy, both from his vast and varied writings on all Torah subjects and from his outstanding students who went on to spread Torah throughout the people of Israel. בת (שמה לא ידוע) (1741 - 1756), נפטרה בנעוריה. חינה (1748 - 1806), שנישאה לזלמן זליג חיניץ מפינסק ואחרי מותו למשה מפינסק. פסיה בתיה (נולדה ב-1750) שנישאה לצבי הירש דונחין מדיסנה. בת (שמה לא ידוע) (נולדה ב-1752) נישאה ליחזקאל הלוי. שלמה זלמן וילנר (1758 - 1780). יהודה לייב וילנר (1764 - 1816). אברהם וילנר (1765 - 1808). טאובה (1768 - 1812), נישאה לאורי שרגא פייבוש מדוברובנו. בגיל צעיר יצא הגר"א ל"גלות" לפולין ולגרמניה, עבר בליסא וברלין ואולי אף באמסטרדם. על פי עדותו של הרב יצחק אייזיק הלוי הרצוג נמצאה חתימתו של הגאון בספרייה הבודליאנית באוקספורד שבבריטניה. במשך השנים התגורר הגר"א בוילנה, אך סירב בעקביות לכהן במשרה רבנית רשמית שתפריע לו בלימודיו. למרות זאת, קהילת וילנה שראתה כבוד לעצמה במגוריו בעיר, נתנה לו הקצבה חודשית קטנה לפרנסתו. הגר"א התפרסם מאוד בהתמדתו העצומה. המסורת מספרת כי נהג במשך כל חייו לישון שעתיים בלבד ביממה, כשכל עיתותיו מסורים אך ורק ללימוד תורה. תלמידו רבי חיים מוולוז'ין תיאר, כי כאשר עינתה אותו קושיה בלימודו לא היה מכניס אוכל לפיו במשך ימים רצופים, ומראהו היה כחוש ומעונה עד שמצא את התשובה לשאלתו. הגר"א נפטר בי"ט בתשרי ה'תקנ"ח (9 באוקטובר 1797) בווילנה שבליטא. [עריכה] דרך לימודו הגר"א דגל בלימוד על דרך הפשט והיה בעצמו בעל בקיאות וידענות רחבת היקף. התנגד ללימוד בסגנון פלפולי חריף, כשם שהתנגדו לו הרמב"ם, המהר"ל ועוד חכמי ישראל נוספים. בבית מדרשו הקטן למדו תלמוד עם הפרשנים רש"י ורא"ש ורי"ף ללא כל פלפול. הגאון היה חדשן מאוד בפסיקת ההלכה ופעמים רבות פסק על פי הבנתו גם נגד המנהג המקובל. לימודו מבוסס במידה רבה על שינויי גרסאות, ועל אף היותו אבי הזרם הליטאי, שיטת הלימוד המקובלת בישיבות הליטאיות כיום שונה מאוד מדרכו . את מרבית שינויי הגרסאות ביצע שלא על פי כתבי יד שהיו בידו אלא בהתבסס על בקיאותו המופלגת בספרות התלמודית והרבנית. בדיעבד, רבות מהגהותיו נמצאות כקולעות לגרסאות הקיימות בעדי נוסח קיימים ומדויקים. במוצאי יום כיפור היה הגר"א ממשיך לצום עוד כמה שעות תוך כדי לימוד תורה. זאת על פי מאמר חז"ל : "מאי דכתיב, ויהי ערב ויהי בוקר יום השישי? מלמד שהתנה הקב"ה עם מעשה בראשית ואמר להם: אם ישראל מקבלים התורה - אתם מתקיימים, ואם לאו - אני מחזיר אתכם לתוהו ובוהו". כלומר קיומו של העולם תלוי בלימוד תורה בלתי פוסק. רעיון זה עמד גם בבסיסה של הישיבה ישיבת וולוז'ין שהקים תלמידו, ר' חיים. עלייתו לארץ ישראל ידוע כי הגאון ניסה בעצמו לעלות לארץ ישראל, ואף כתב לבני משפחתו אגרת מהדרך, שהתפרסמה אחר כך בשם "עלים לתרופה", ובה כתב בין היתר שהוא הולך ל"ארץ חמדת ישראל וחמדת ה', שכל עליונים ותחתונים תשוקתם אליה". אולם, ניסיונו זה לא צלח והוא נאלץ לשוב על עקבותיו לאחר שהגיע להולנד. קיימת אי-הסכמה לגבי השנה בה ניסה הגר"א לעלות לארץ. דב אליאך, בספרו "הגאון", טורח להוכיח מדקדוקים בלשון האיגרת כי נסיון זה היה כאשר הגאון היה בסביבות גיל ארבעים. בספר 'קול התור' מופיעה מסורת כי הוא ניסה לעלות לארץ בשנת תקמ"ב (1782). לעומתם, ד"ר אריה מורגנשטרן טוען כי הנסיון היה בסביבות שנת תקל"ח, על פי מסמכים של הקהילה היהודית בהולנד, אולם לא ברור לחלוטין שאכן הכוונה במסמכים לגאון. כפי המסופר ב'קול התור', הוא ביקש לחדש את היישוב היהודי בארץ, להפריח את שממותיה של ארץ ישראל, וליצור בה זן של אנשים חכמים ומוסריים שקרא לו "אנשי אמנה", ולסלול בזאת את בואו של המשיח שהאמין כי אמור להופיע בשנת הת"ר (1840). כאשר הוא הכריז "קול התור נשמע בארצינו" (על פי שיר השירים). לשם כך שידל את תלמידיו לעלות לארץ שהייתה בחורבנה, ומינה לעמוד בראשם את תלמידו הרב הלל משקלוב, ואכן 14 מתלמידיו עלו בראש שיירה לצפת ולירושלים בתחילת המאה ה-19, 11 שנה לאחר מותו, ומצאו בה כשלושים יהודים. בעקבותיהם עלו קבוצות נוספות בעשרות השנים שלאחר מכן. בשאיפתו של הגר"א לחבר ספר הלכה מקיף משתקף דפוס הפעילות שאפיין גם את מפעלו ההלכתי הגדול של רבי יוסף קארו בכתיבת השולחן ערוך יותר ממאתיים שנה לפני כן.